Christiane Amanpour is going back to where she belongs after a problematic stint as host of ABC's Sunday morning This Week. The network announced Tuesday night that Amanpour will leave the public affairs program to take on a dual role as foreign affairs anchor/reporter for both ABC News and CNN International. George Stephanopoulos,, who hosted This Week from 2002-'10, will resume that role on Jan. 8th while remaining as co-host of ABC's Good Morning America. This apparently assures the married father of two young children of basically no life outside the workplace, and brutal hours as well. "I am looking forward to getting back into the field to report stories on global issues that matter greatly to the American people," Amanpour said in a publicity release. "This role is groundbreaking, bold and very different! I am thrilled and honored." 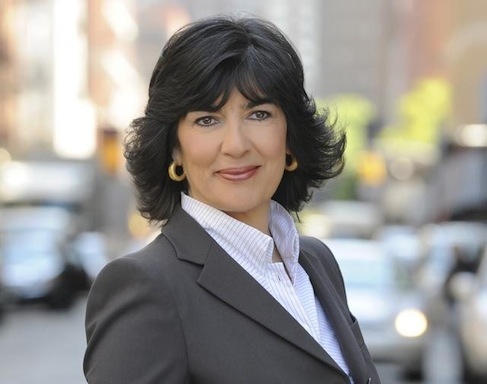 Amanpour left CNN to host This Week in what was seen as a surprise hire to replace Stephanopoulos after he went to GMA. She began presiding over This Week on Aug. 1, 2010. Ratings since have slumped, with the program now trailing both NBC's Meet the Press and CBS' Face the Nation, which soon will be expanded to an hour. CNN welcomed Amanpour back as the anchor of a new weekday program for its International channel. "We could not be happier that through this unique arrangement with ABC News her experience and global perspective are returning to a nightly news broadcast for our international audience," CNN Worldwide president Jim Walton said.